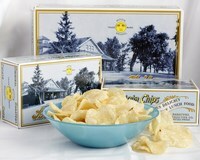 George Crum was said to have sold his wares to other restaurants and outlets during the period of his early fame, but the oldest Potato Chips company in America is The John Boyd Company, which began in 1868. The first major commercial venture was said to have been undertaken by William Tappendon of Cleveland who began selling Potato Chips to grocery stores in 1895 after first making them in his kitchen and then turning his barn into the first Potato Chip factory. Although there were several cottage industries, such as Tappenden’s prior to the barn venture, the recording of larger factories proposes this as an early time-line. In Great Britain, Carter’s Crisps was first incorporated in 1900, but the first record of their sale of Crisps was in 1913. So, 1913 is an unreliable, but still the best suggested date for the birth of the Crisp. Just to add further ambiguity, Mr Carter was said to have discovered them in France, not America.